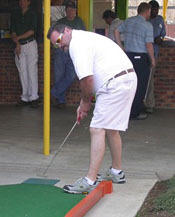 20 July 2002 - Wilson, N.C. - A slow start didn't come back to haunt Billy Caudle on Saturday at Wilson Open at the Wilson Putt-Putt Golf and Games facility. Caudle opened with a 31, then putted a second round 26 and a final round 25 for a total of 82 and a one-stroke victory in the professional division on Saturday at the Wilson Open. Caudle collected his first Professional Putters Association win by edging second place finisher Vince Batten, who played consistently by carding rounds of 28, 28 and 27 for a final tally of 83. Brad Lebo (26-31--28) earned third place with an 85. Malcolm Shumaker also overcame a sluggish start and followed up his opening round 33 with strong rounds of 28 and 29 for a 90, and a two-stroke victory in the amateur division. Finishing in a tie for second was local APA player Gerald Vick (29-33-30--92) and Lance Purdue (32-28-32--92). The novice division was highlighted by a battle between three local players. Johnny Brown (27-32-30--89), the 2001 Wilson City Singles champion, and current better-ball points leader Vince Edwards (30-29-30--89) were tied after 54 holes. Brown defeated Edwards in an 18-hole playoff. Local course veteran William Lewis (29-31-30--90) finished third. Story provided by Wilsondaily.com (22 July 2002 issue) with scores provided by Rick Baird.